We trust God for it. We can make a conscious decision to trust God, or another person, but at the same time trust is also something that grows with experience. We have been experiencing God’s marvelous care for us in so many ways being on the road as pilgrims since 2005 without residence, having travelled thousands of miles without savings, or working for money. In some situations, where other people might have difficulty to trust God, trusting has become quite natural for us, because of the practice we have had. But we are still learning as well, and there are always new challenges ahead. David and I both desire to learn complete trust in God in every aspect of our lives, which includes trust concerning our state of health. Comparatively speaking we have been enjoying tremendous strength and fitness during these years of our pilgrimage, yet we have both also been sick at times. It has always been a time of learning and gaining some understanding. When one of us was sick we usually had a place to rest and recuperate. Most of these times we were with helpful people who had taken us in. We like to cooperate in the healing process by eating and resting right. The times it was not possible to get good rest, God gave us the strength to continue being on the road in spite of being sick, and we got better even without getting much rest. 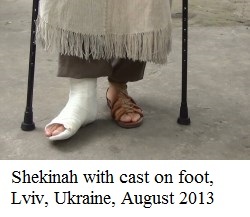 August 2013, on our way from Poland into the Ukraine in the middle of the night I, Shekinah, tripped in the dark and fell. After sleeping in the forest we arrived in Lvov the next day. I had been hobbling along with some pain in my foot and thought I had a sprained ankle. We were sitting in the street singing some songs and talking with people. (See video "Wild Wind of Freedom") When we sing we purposely do not put out the guitar case or any other container to encourage contributions, but that morning quite a few people started giving us money anyway, surprisingly much. When we took a break, we saw that my foot was very swollen and had turned blue. It looked like I had more than just a sprained ankle and we felt that it would be good to get an x-ray. It turned out that, in fact, I had broken a bone in my foot. God had supplied exactly the money we needed for the x-ray, the doctor’s visit, the cast and crutches. How amazing. And he set us up in a community of some very sweet young people, with plenty of time to work on our web-site, while my body was producing new bone tissue to fix my foot. This was the first time in 8 years that an accident of a little more serious nature happened to us. I have come to understand that God never lets anything happen to me, unless there is something good in it. When the good is not so evident, then I talk with God about it in my quiet times. Some things that initially I still understand only partially I understand better later. I have come to realize that every situation has a reason and a loving purpose.